Not a want, but a literal NEED. 1. 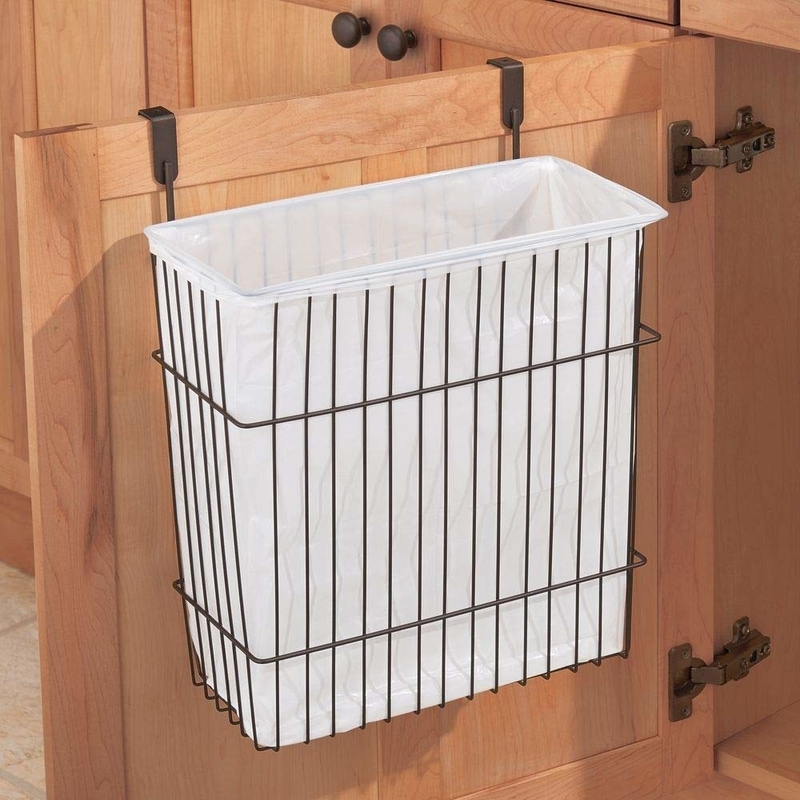 An over-the-cabinet bag holder for an easy spot to put your shopping bags when you come back from the store, rather than leaving them strewn across the counters... or worse... ending up in the garbage, never to be used again. It can hold up to about 50 bags! Promising review: "I love this so much! I have been looking for something for all of the grocery bags I keep! We use these for our bathroom trash bags. This little thing is a awesome. And my kids can easily reach inside and get a bag out! Love it!" —Lindsey T.
Get it from Amazon for $13.99 (available in eight finishes). 2. An airtight container set you just pop to open and access your freshly-stored food items. The three-piece set includes one .9 quart container, one 1.5 quart container, one 2.1 quart container, and a scoop. The five-piece set includes one 2.1 quart container, two 0.9 quart containers, and one 0.3 quart container. The silicone seals on the containers are dishwasher-safe, but it's recommended to hand-wash the other parts! See our review of these pop containers. Get it from Amazon for $36.26/three-piece, or $49.95/five-piece. 3. A coffee pod carousel for a chic AF method of organizing your favorite coffee/tea/hot chocolate, etc. drinks. Get it from Amazon for $13.40. 4. Or if you're kitchen is super duper tight on space, a drawer you can place your coffee maker on top of, and then fill the drawers with your pods, sweeteners, and creamer. Get it from Amazon for $12.79 (available in nine styles). 5. And if you're more of a tea drinker, then this organizer for a perfect way to store over 100 tea bags in a neat and clean fashion... and that's the tea on that. Promising review: "Do I really need a tea bag organizer? That's what I was thinking when I ordered this. And when I took it out of the box. And when I filled the first little bag holder. But as the pile of empty boxes grew larger, I knew the answer was yes, I do need a tea bag organizer. I was using a whole shelf and a half of jumbled tea boxes, which I had to sift through to look for a specific tea. In the end, I think this held about eight or nine boxes of tea bags (I crammed some of them). I am so happy that I got this!" —Sarah C.
6. A front sink tray so you can keep your sponges, scrubbers, and brushes out of the sink, because, TBH, they don't really belong living at the bottom of it. 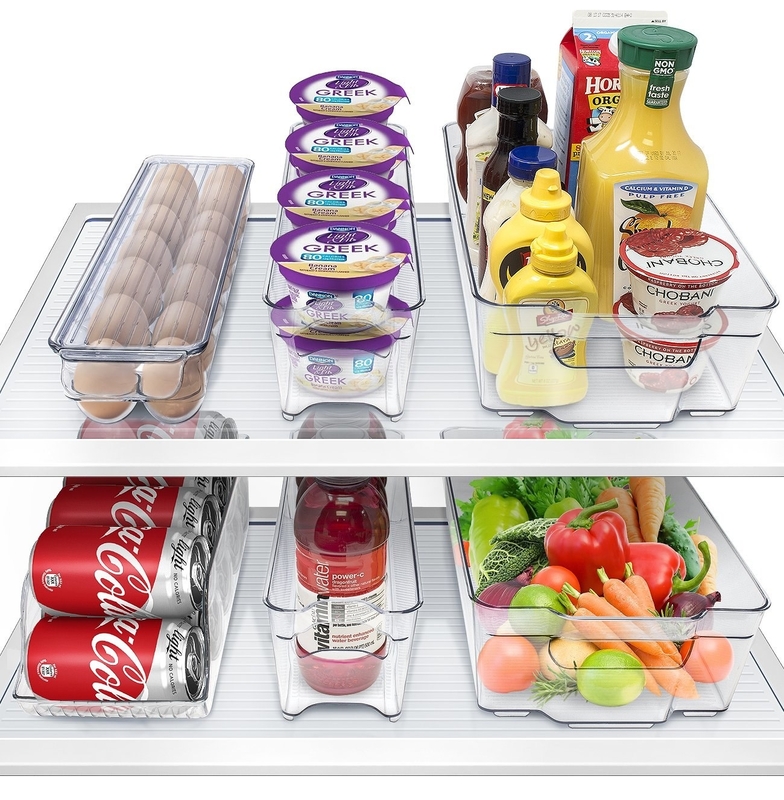 Includes one open tray, one accessory tray with a ring holder, and two pairs of hinges and mounting hardware. Get it from Amazon for $17.55+ (available in two size). 7. An adjustable rack for keeping all your under-the-sink items accessible and orderly. Has an expandable rail, and four adjustable height levels. Get it from Amazon for $36.99. Holder is divided into three sections and is BPA- and chlorine-free, food-safe, and made of shatter-resistant plastic. Recommended to clean with mild soap and water. Get it from Amazon for $12.99/one, or $19.99/two. 9. A bakeware pan rack that'll make going to grab the cookie sheet or muffin tin, or whatever it is you may need, a lot less hectic than having to go through the pile and lift up every item until you get the right one. This features seven adjustable dividers, and has soft non-slip feet to ensure everything stays in place! 10. A can organizer so the next time you just want a dang bowl of soup for dinner, you don't have to sift through the cans of vegetables, sauce, and beans first just to find what you want. 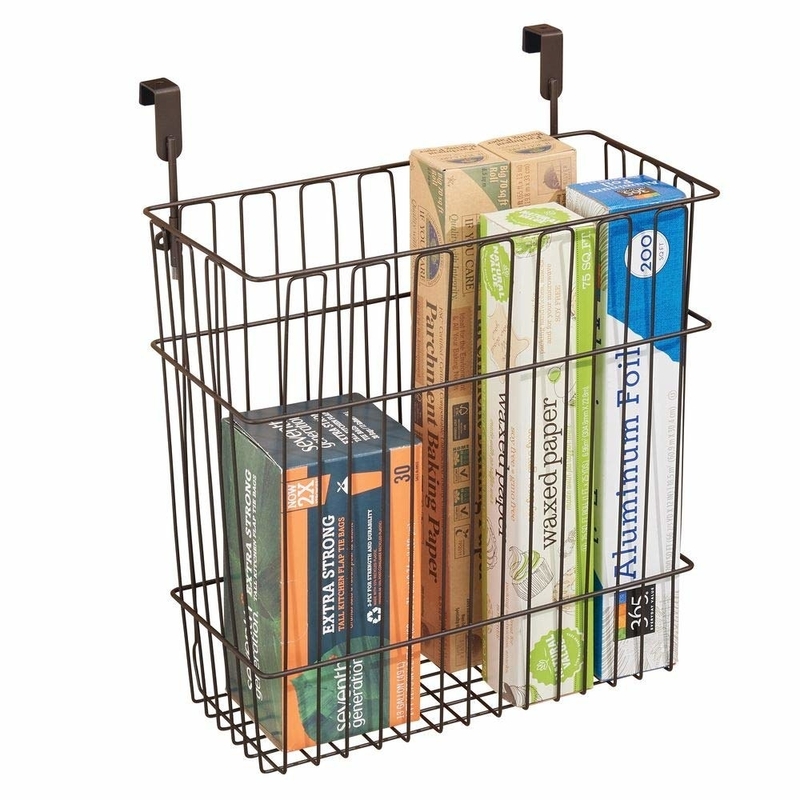 You can store up to 46 cans and jars of various sizes on this rack! It has six adjustable plastic dividers, and boasts sturdy-construction! Get it from Amazon for $20.87+ (available in three finishes). 11. A cabinet Lazy Susan to utilize for spices, condiments, or even things like vitamins and medication, so when you need to find one of those things, you can just give this a little spin, and voila! Promising review: "I love this product. It is strong and sturdy. I've bought three for my cabinets. And they haven't broke, despite being dropped and stepped on by a 5-year-old who thought it was a good idea to use them to be a ballerina. They are easy to clean and use. I would definitely recommend for spices/medications, or anything kitchen cabinet related. I have one in the bathroom, and under the sink for the cleaning supplies as well, and we love it!" —Kay M.
Get it from Amazon for $7.99+ (available in four colors). 12. A cereal dispenser that'll not only help de-clutter your pantry a bit, but will also look really cool on display in your kitchen, not to mention, make breakfast time way more fun. These dispensers are designed to preserve food freshness for 45 days, and each one can hold up to 17.5 ounces of dry food. Each twist dispenses about 1 ounce. Get it from Amazon for $15.16+ (available in four colors, and three sizes). 13. A storage cabinet you can hang behind your door so you efficiently use every open space in your home. It features eight shelves and is super easy to mount on door hinges. Get it from Amazon for $159.99 (originally $224.99). 14. A hanging basket that'll make an additional storage spot for things like plastic wrap and bags, but can also be used as a mini waste basket! If using as a trash bin, this basket can accommodate 4 gallon trash bags, or you can just use plastic grocery bags! Get it from Amazon for $19.99 (available in three finishes). 15. A multi-colored container set you can easily stack and stow away when not using — they come in a variety of sizes to fit you and your family's needs. These containers are freezer-, microwave-, and top-rack dishwasher-safe! Plus, they're BPA-free and food-safe! Get them from Amazon for $18.98+ (available in five sizes). 16. A rolling cart ideal for those who live with roommates in a small space and want a good spot to store things like condiments, sauces, and snacks. 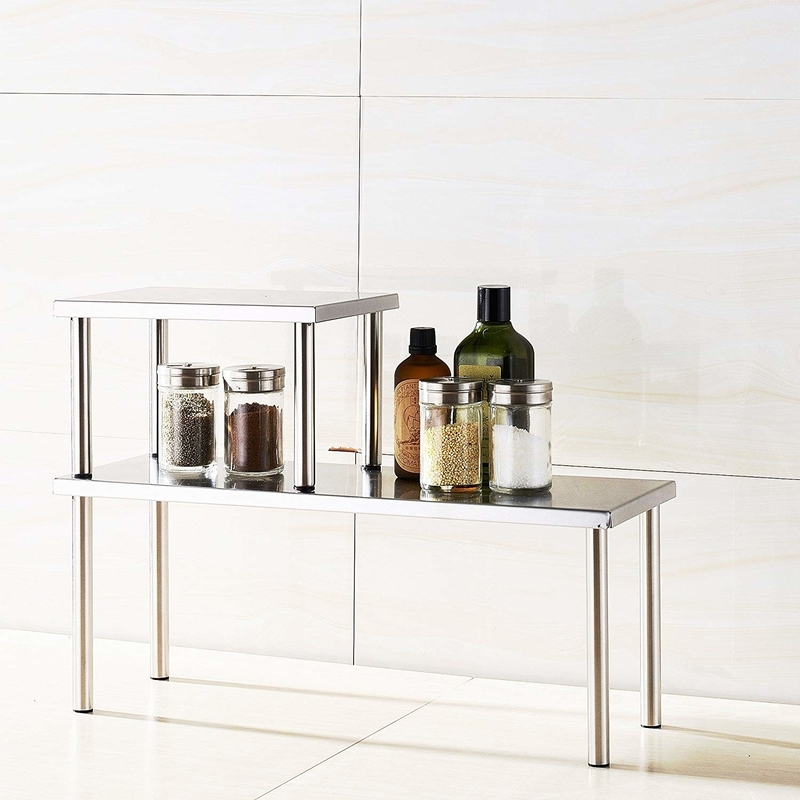 You can also use it as a bar cart for storing bottles of wine, beer, and liquor. 17. A sink caddy to hold your dish-cleaning supplies, while still keeping them easily in-reach. Features four suction cups to help it stick to your sink securely, and ventilation holes and elevated sponge storage compartments to maximize air flow for quicker drying time. Get it from Amazon for $16.97+ (available in two finishes). 18. A three-tier hanging basket that'll seriously upgrade how you store fruit, while making your kitchen look incredibly trendy. Get it from Amazon for $13.97 (originally $14.99). 19. A pan rack you are definitely gonna thank yourself for buying on those nights you get home from work exhausted, and need to make dinner, and the last thing you feel like doing is wrestling your way through your cabinets just to find the right size. This can hold up to five pans with vertical installation and four pans with horizontal installation. Get it from Amazon for $22.27 (originally $24.99). 20. A wall mount to use as an easy way to hold your tools like brooms, mops, and more, rather than just putting them in the corner against the wall and hoping they don't fall down. Get it from Amazon for $11.99+ (available in two sizes). 21. A mug tree for those who can obviously tell there is no cooler or better way to show off your awesome mug collection than with this baby. Plus, it frees up some cabinet space! Holds six mugs and is rust-resistant! Get it from Amazon for $12.95+ (available in three finishes, and two sizes). 22. A pull-down spice rack so the next time your recipe calls for a pinch of a spice you usually never use, you can find the spice in a pinch. Get it from Amazon for $15.57+ (available in three finishes). 23. Or a pack of spice magnets to make a pretty spectacle of your seasonings — keeping your spices hidden away in the pantry is so yesterday, just put them out on display! These feature see-through lids with openings for pouring or shaking. Get it from Amazon for $8.95/three-pack, $11.95/six-pack, $19.95/12-pack, or $37.95/24-pack. 24. And there's the spice gripper strips — another fun way to put your spices on display, while leaving more room in your pantry for other things. Comes with six strips — three black and three white. Each strip has five clips and is backed by pre-applied 3M LSE tape. It also comes with additional screws incase you need extra securing. This fits most standard round containers! Get it from Amazon for $9.87. 25. A pack of storage bins for keeping the contents of your fridge and freezer more organized and easier to find. Every time you clean the inside, you promise to stay more organized next time around, and it just never happens. Not this time! Set includes two wide drawers (ideal for fruit, veggies, and other larger food items), two narrow drawers (ideal for snacks, condiments, and slimmer items), one can dispenser drawer (can hold up to 10 standard-sized cans, small-sizes food cans, juice boxes, and other drinks), and one egg drawers (can hold up to 14 eggs). These are BPA-free, and recommended to hand-wash with mild detergent and water. 26. 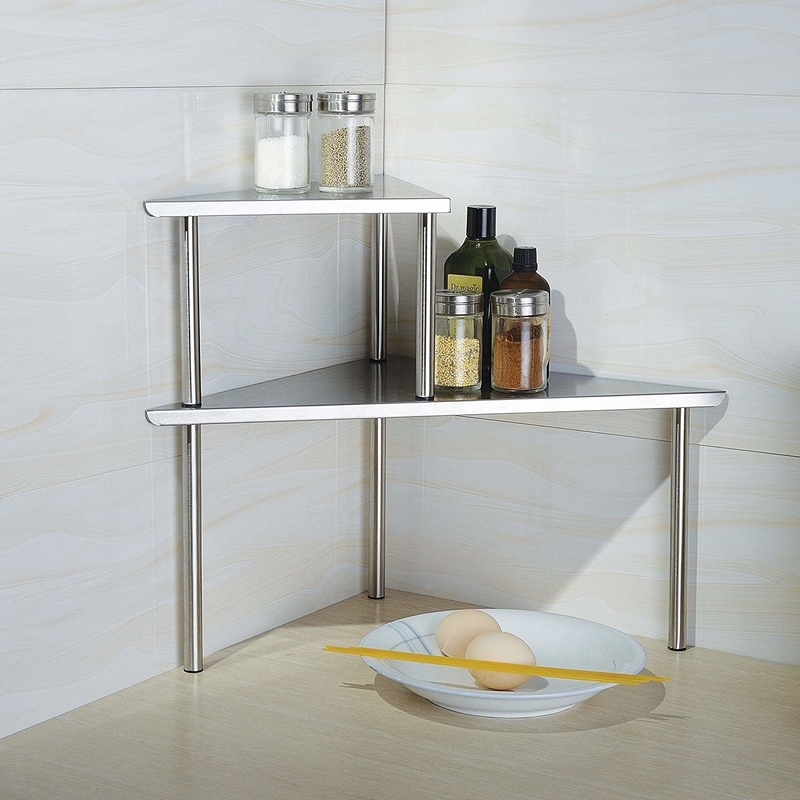 A two-tier shelf to add some sleek decor into your living space WHILE serving as a cute spot to store kitchen items. We love a multi-purpose product! Get it from Amazon for $23.19/triangle, or $24.64/rectangle. 27. A wall-mount pot rack because your pretty cookware deserves to live a life beyond just being trapped in the cabinets. Has 10 moveable hanging hooks, and can withstand 30–40 lbs. Get it from Amazon for $35.99+ (available in two finishes). 28. A bamboo wine rack for a fun and neat way of putting your fave bottles of vino on display. Now, just invite a few friends over, buy some cheese, and work on making your way through each of them! This has a six bottle capacity! Get it from Amazon for $16.89+ (available in three colors). 29. A lid organizer to get if you're someone who knows the only thing worse than struggling to find a specific pot or pan is trying to grab the right lid. Ugh, it's the WORST. This comes with two-packs, and each rack can store three lids, AKA six lids total. It comes with three screws for each rack for easy installation. Promising review: "Rack holds all of my glass lids perfectly. There is ample space when using some of your smaller lids to 'double up' so I am able to hold all of them between the two racks. I have eight lids of varying sizes, from one for a gigantic frying pan, to a tiny saucepan. My lids have the arch style metal bracket, (similar to the ones they show here with the orange handle). I finally have a proper space to keep all the lids organized without them sliding all over the cabinet every time I try to grab just one!" —Kim S.
30. A bottle organizer that'll provide a nice little area to keep you and your fam's drinking vessels when they're not being used. Each rack can hold up to three bottles! Get them from Amazon for $19.99/two-pack, $36.99/four-pack, or $69.99/eight-pack. 31. A cutlery organizer for opening your drawer to a collection of forks, knives, spoons, and other utensils organized in a civilized manner. 32. A wrap organizer to hold your boxes of plastic baggies, wax paper, aluminum foil, plastic wrap, slow cooker liners, and more! It features eight adjustable wires to fit a variety of boxes of different shapes and sizes. It's made of durable, ABS plastic! 33. A paper towel holder/shelf so you can store things like spices or some cleaning supplies, and hang your paper towel roll in order to free up counter space. Promising review: I am absolutely in love with this paper towel holder. It is not only great looking but so easy to use. No more tearing half the roll of paper of towels when you only want one. This really gives you only one towel. It is great for me since I am disabled. Best paper towel holder I've ever owned." —Cathie C.
Get it from Amazon for $15.75. 34. A towel bar that will give you an actual place to hang your dish towels, rather than just leaving them strewn across your kitchen surfaces. Features a non-absorbent foam baking to protect your counters. 35. A magnetic knife strip for anyone who just doesn't have the counter room for a knife block, or the drawer space for storing away their knives. And anyway, this thing does look super decorative, don't you agree? Get it from Amazon for $35.95+ (available in 11 finishes, and 14 sizes). Make your life even tidier. Check out some of the best home organization products on Amazon, the best all-natural cleaning products for your home, the best bathroom cleaning products, organization products perfect for neat freaks, and, of course, our ultimate guide to cleaning every single room in your house.